The University of Texas at San Antonio originally hired Anderson Marketing Group to develop a recruitment campaign. However, as discussions progressed, it was determined that the university didn’t have a solid brand positioning in the marketplace. Anderson proceeded to develop a brand identity for UTSA. Anderson conducted a telephone survey of targeted groups to find out what the UTSA image was in the marketplace and to find out what type of considerations entered into college choices. The targeted groups were representative of the general population of San Antonio in terms of ethnic diversity. Groups of high school seniors, community college students and potential graduate students were surveyed. The research revealed UTSA was perceived as accessible and as affordable. However, UTSA wasn’t perceived as a high quality academic institution or as one whose prestige could get a graduate a good job. The research also indicated that undergraduate prospects really did not have a handle on what degree programs UTSA specialized in. These last two factors were listed by those interviewed as most important when making a decision about a university. Anderson developed an advertising campaign that addressed the weak points identified in the research. Ads were designed to stress UTSA’s academic strength and show students they could “go far” if they earned a degree from UTSA. Since the research showed there was a low level of general awareness about UTSA, it was deemed important to build an image or identity for the university. The most cost-effective way to do this with a limited budget (approximately $185,000) was a radio and outdoor campaign. The media was predominately focused in the San Antonio market with some radio exposure in Corpus Christi, The Rio Grande Valley and Laredo. The schedule was concentrated over a six-month period (December through May) to accommodate the application and enrollment cycle. In addition to radio and television, theater advertising was used in select San Antonio theaters during December (one of the biggest months for movie attendance). The campaign centered around the positioning line “Come Here. Go Far.” The positioning line was designed to be immediately comprehensible because it was linked to a strong visual element that illustrated the type of degree programs offered. The message was tested with a series of three focus groups made up predominantly of Hispanic females and males. The line tested well with this group. To achieve maximum results among the targeted groups, Anderson developed a radio schedule on stations that had high Hispanic/Anglo demographics. Spots were produced in English and Spanish. We’ve included a sample of the radio commercial on the enclosed DVD. As the marketing budget increased the next year, Anderson added transit signs and newspaper to the media mix. The majority of the marketing budget was once again focused in the San Antonio market. However, nine-week radio schedules targeted to undergraduate, transfer and graduate students continued to run in the Corpus Christi, Rio Grande Valley and Laredo markets. 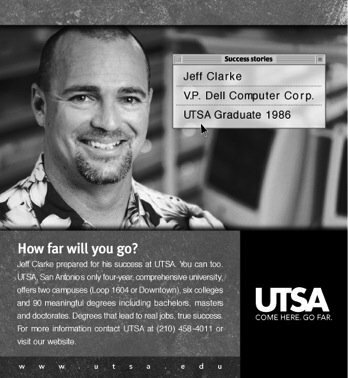 Print ads highlighted a UTSA graduate and focused on his/her success. Anderson Marketing Group was also responsible for putting together programs targeted to specific audiences. In 2000, Anderson developed a direct mail campaign targeted to graduate students that was highly effective in raising the awareness of the variety of advanced degree programs available. 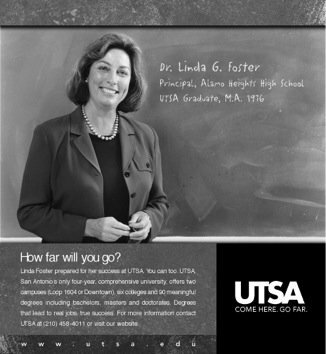 Anderson handled UTSA’s advertising from 1998 through 2002. The various marketing campaigns developed for UTSA substantially increased awareness of the university among the various target audiences as well as the number of applications each year.